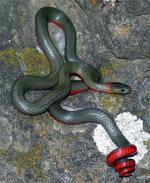 A medium-sized slender snake with a head not much wider than the cylindrical body with smooth shiny scales. The scale count at mid-body is usually 21 - 23. Black, red, and white rings circle the body. The red bands are noticably wider than the others, with the white bands wider than the black. Some black bands may widen and cross over the red bands on the back. A red band surrounded by two black bands is referred to as a "triad." On this subspecies there are 23 - 56 triads, with an average of 41. Typically, fewer than 60 percent of the triads have complete red bands with no black crossovers. The bands continue around the belly, but the coloring is paler, and the black and white bands are reduced in size giving the belly a reddish coloring. The nose is black with little or no red. The rear edge of the first white band on the head is on or in front of the last upper labial scale. This subspecies, Lampropeltis zonata parvirubra - San Bernardino Mountain Kingsnake, is found in southern California in the San Jacinto, Santa Rosa, San Bernardino, Santa Susana, and San Gabriel Mountains, and the Verdugo Hills. A habitat generalist, found in diverse habitats including coniferous forest, oak-pine woodlands, riparian woodland, chaparral, manzanita, and coastal sage scrub. Wooded areas near a stream with rock outcrops, talus or rotting logs that are exposed to the sun are good places to find this snake. From 800 ft. to 9,000 ft. on Mt. San Jacinto. (245 - 2750 m). The SSAR, whose taxonomy we follow on this website, does not recognize any subspecies of L. zonata but I will continue to treat separately the 5 traditionally-recognized subspecies found in California to illustrate some of the regional variations found in this snake. 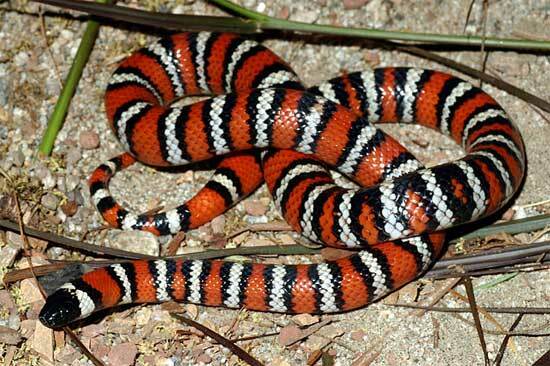 Conservation Issues (Conservation Status) The State of California considers the subspecies L. z. pulchra - San Diego Mountain Kingsnake to be threatened. It is protected by law. No California mountain kingsnakes can be collected in Orange and San Diego counties, and in Los Angeles County west of Interstate 5.